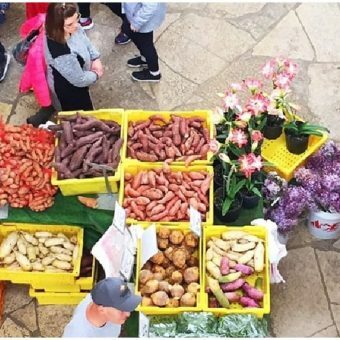 With fresh foods, sweet treats and flourishing floral displays, we’ve hit the holiday season early this July. Earlier this week, we had the privilege to participate in a holiday tablescape showcase with one of our partner venues, Cafe Brauer. Tasked with designing a creative catering buffet display for the holiday season, our design pros hit the drawing board. We landed on a simple, subtle green-and-white theme that we felt encapsulated both the current summertime vibes and the upcoming holiday season. Think winter in the Hamptons. Actually, think Litchfield County, CT.—lush, elegant cottages nestled into a tree- and flower-lined East Coast landscape. 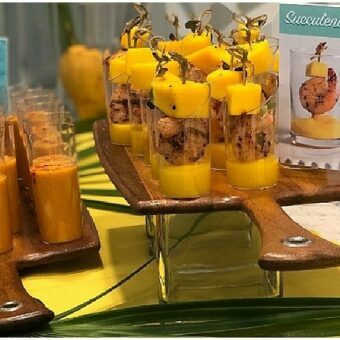 Here’s how we brought our showcase food display and tablescape to life. First, we find the right materials. 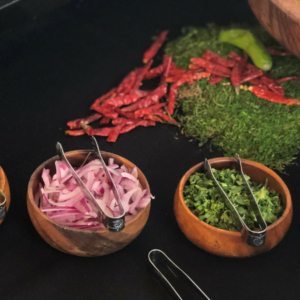 First and foremost, creative catering buffets are about so much more than food. Designing a tablescape is a form of catering art. 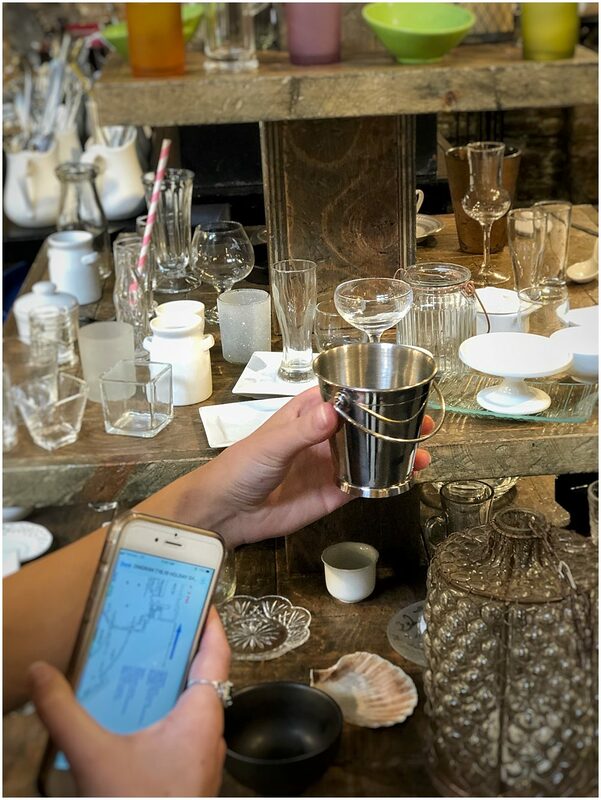 Armed with our still nebulous concept, we headed to Tablescapes, a neighboring business with whom we have a time-honored creative relationship, to find our vessel and decor rentals. 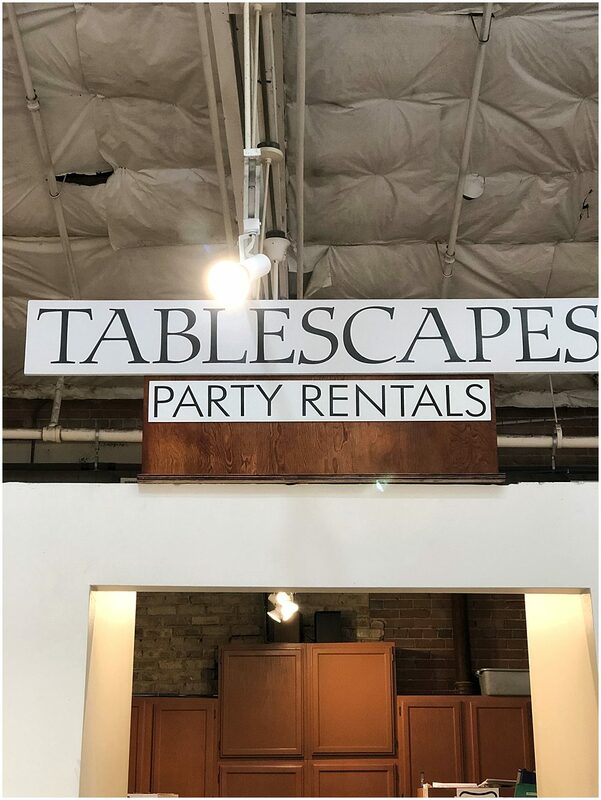 Entering the door at Tablescapes feels like walking into forty different parties. 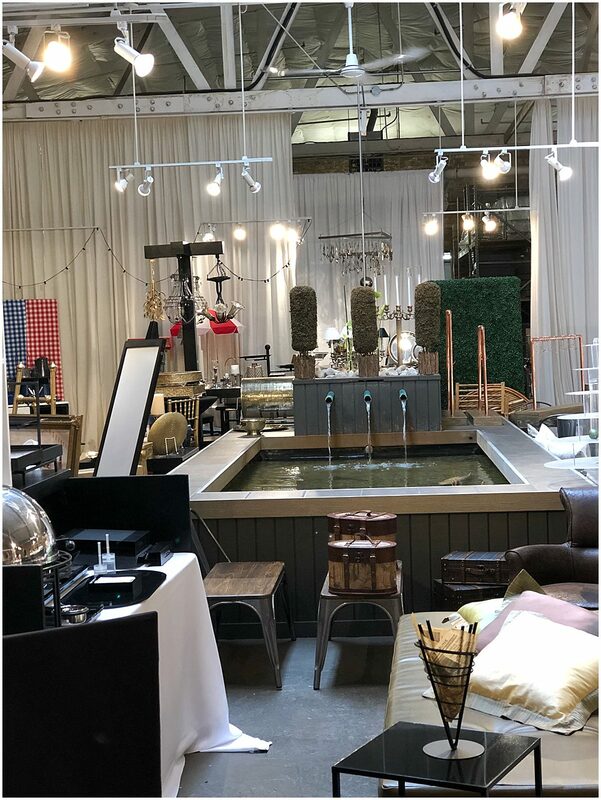 It’s a warehouse space fully stocked with items for every event need—tables and chairs, dinnerware sets, silverware, popcorn makers, domes, candles, caddies and more (including a miniature fountain and fish pond!). Within five minutes of our arrival, this enormous faux hedge wall had caught our design pro Kenny’s eye. We measured the hedge, but ultimately realized we didn’t know how much depth we would have behind our station. 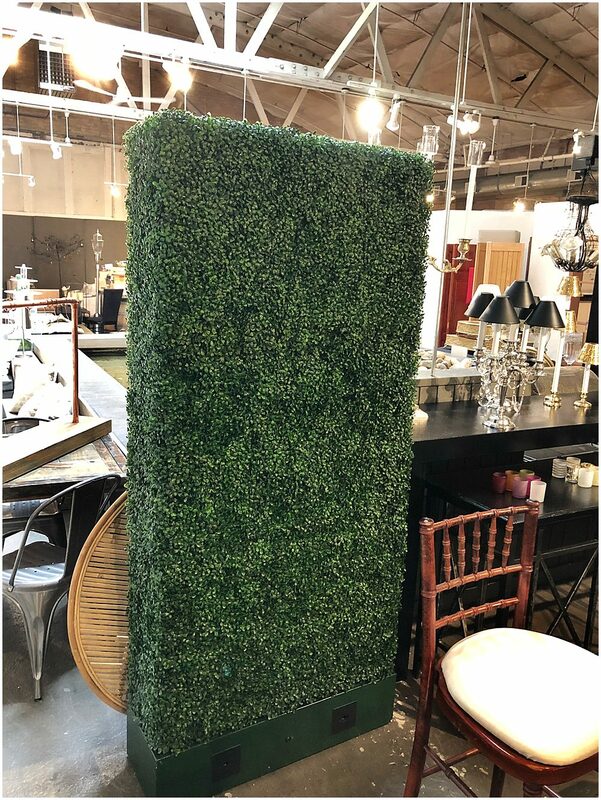 Instead of using the full hedge as a backdrop, we requested it in pieces, with a plan to arrange four pieces around the perimeter of the showcase table. Next, we browsed serveware and utensils. Our East Coast theme practically screamed for seafood, and these little silver buckets we found inspired us to use something with a claw—crab or lobster. Ultimately, we chose an alternate vessel, but this creative Tablescapes find gave us a direction for our menu. Kenny was particularly drawn to these thick, elegant green-glass serving dishes. The hint of seafoam was reminiscent of salt- and sand-smoothed seaglass. Kennicott Chicago, our wholesale florist, was the final errand on our trip. We didn’t want to actually purchase any florals so many days before the event, so we shopped speculatively. For a subtle holiday feel, we knew we needed to elevate our greenery with crisp white blooms. 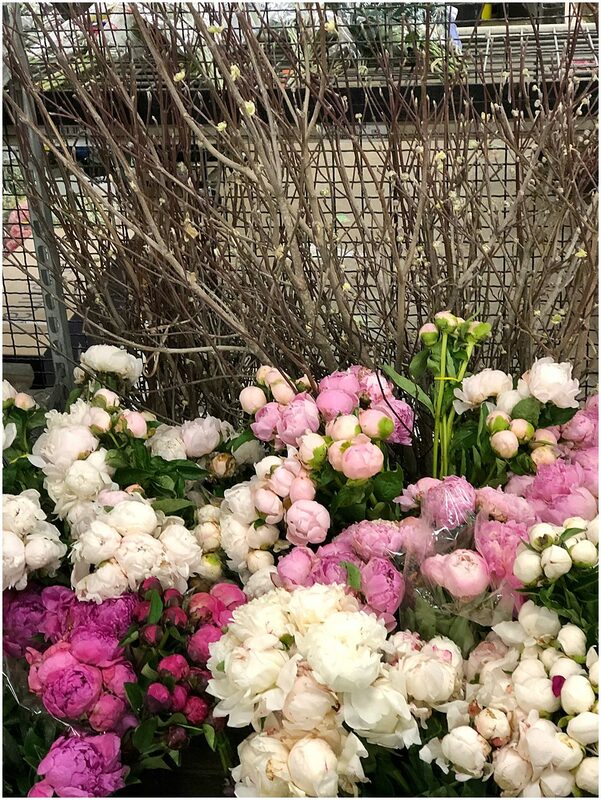 We scoped out traditional white carnations, white garden roses, and white and pink dahlias. A tablescape element we knew we wanted to include in our buffet display is submerged florals. Submerging a bloom in water gives its petals an exaggerated, almost surreal blossoming effect. With that in mind, we settled on petal-heavy white mums. 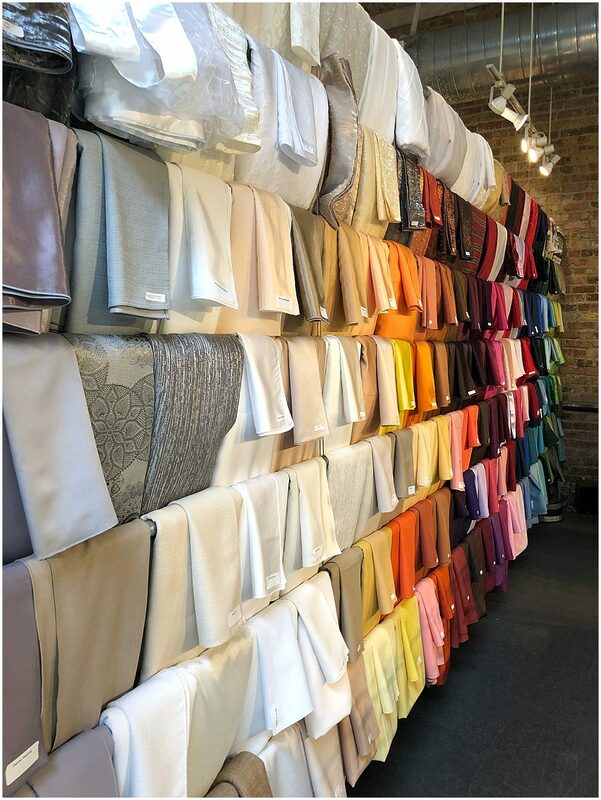 A few days after our window-shopping excursion, we took a trip to our EC warehouse (conveniently, next door to our office!) to scrounge for more table staging materials. We came across a dozen raw wooden crates we envisioned as food trays. 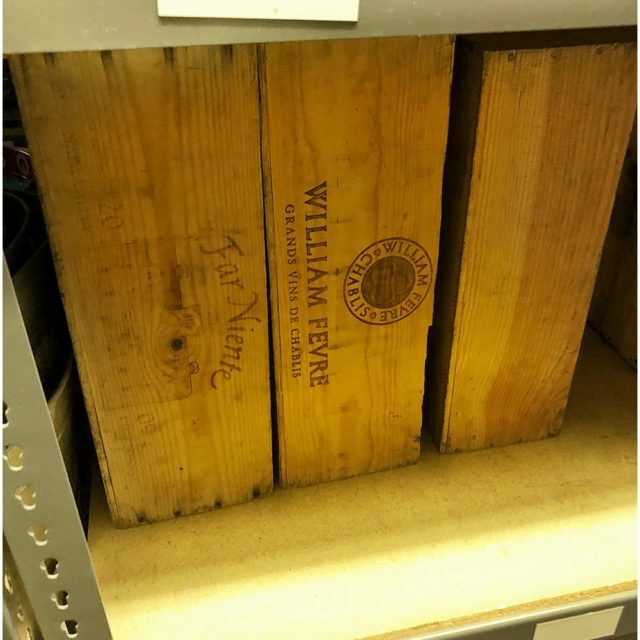 The way we found them, the boxes were a little too farm-chic. But, painted white, they would provide the perfect picket-fence feel, as well as accentuate the white florals we chose. We added that to our to-do list. We found a little folding table and started staging right there in the warehouse. For a dynamic buffet display, it’s important to incorporate elements at a range of height levels, which prompted us to stack and flip our boxes. 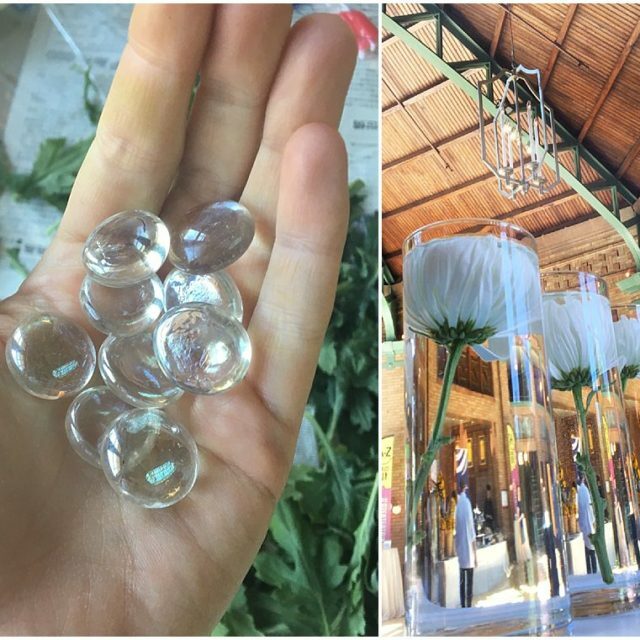 We came across a full set of clear glass cylinders perfect for displaying single submerged flowers. Our most exciting find, however, was this oversized glass cylinder. 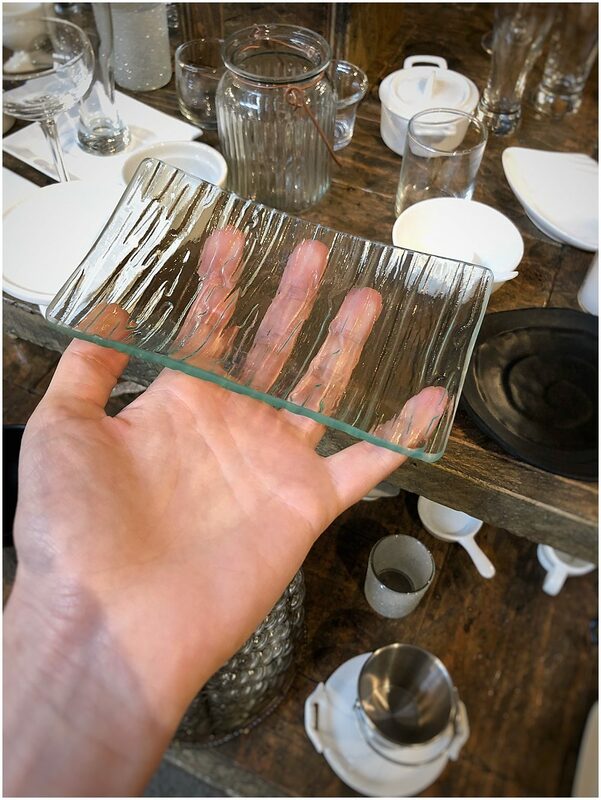 It would not only add extra height to our table, it would also be the perfect subtle statement piece for our tablescape. 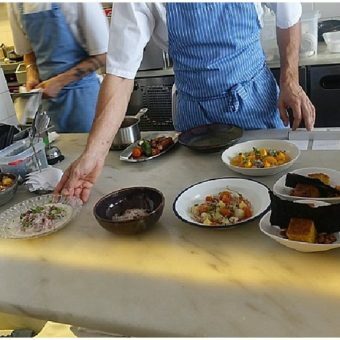 We work with our in-house chef to make a menu that’s right on theme. 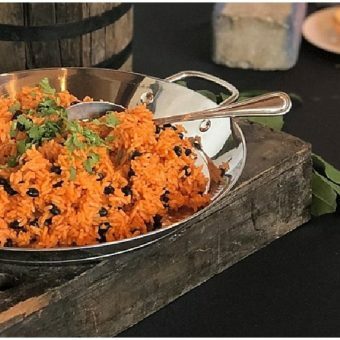 The showcase required us to provide one savory dish and one sweet dish to share with guests and other vendors. 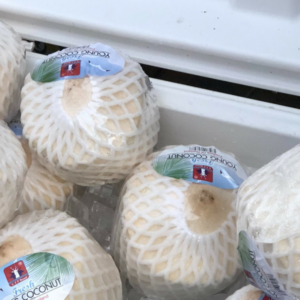 We knew we couldn’t claim our East Coast theme without some seafood, and we felt inspired by the Tablescapes serveware to incorporate lobster into our spread. 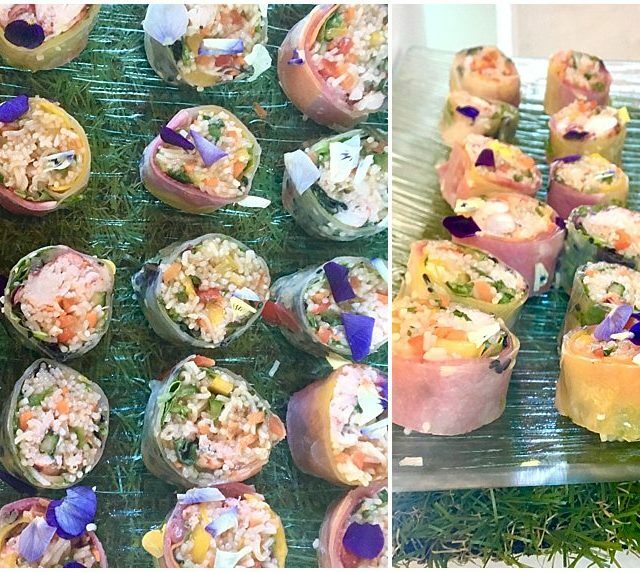 For our savory option, Chef Shawn made fresh “lobster rolls,” tucking silky lobster meat, fresh summer vegetables, microgreens and edible flowers into soft rice paper—the perfect middle-ground between a summer event and a holiday party. Our sweet treat also incorporated an edible floral element, in coordination with our spring rolls. 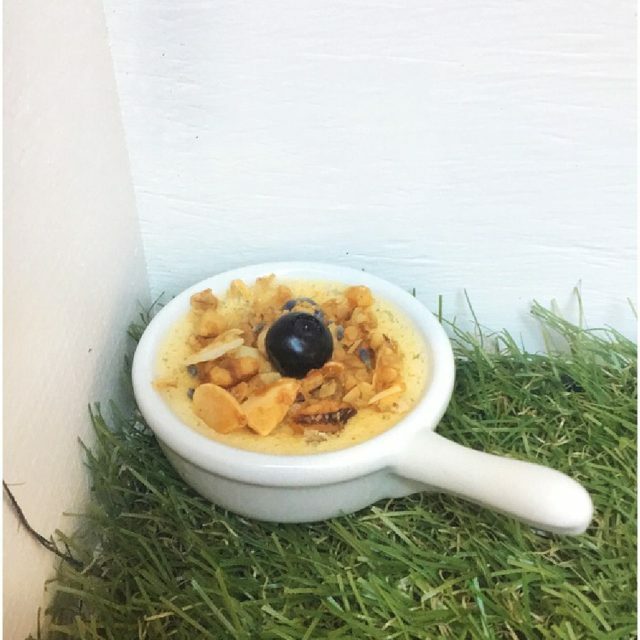 We served mini lemon buttermilk puddings topped with house-made lavender granola and a single candied blueberry. The vessel was a miniature white porcelain skillet, and we offered guests real silver demi spoons as a utensil. We arrive early, and set up on-site. On the day of the showcase, we are ready to finally bring our vision to life. 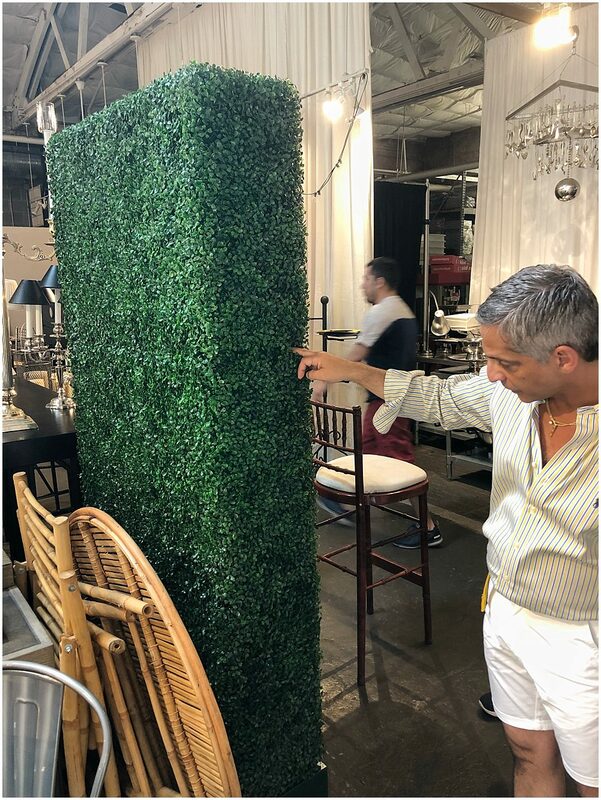 Our faux hedge pieces arrive just as planned. We arrange them around the table and realize they are actually slightly taller than it, giving the illusion that the actual tabletop is inset—it elevates the display. We add our picket-fence-white boxes and get to work on the florals. 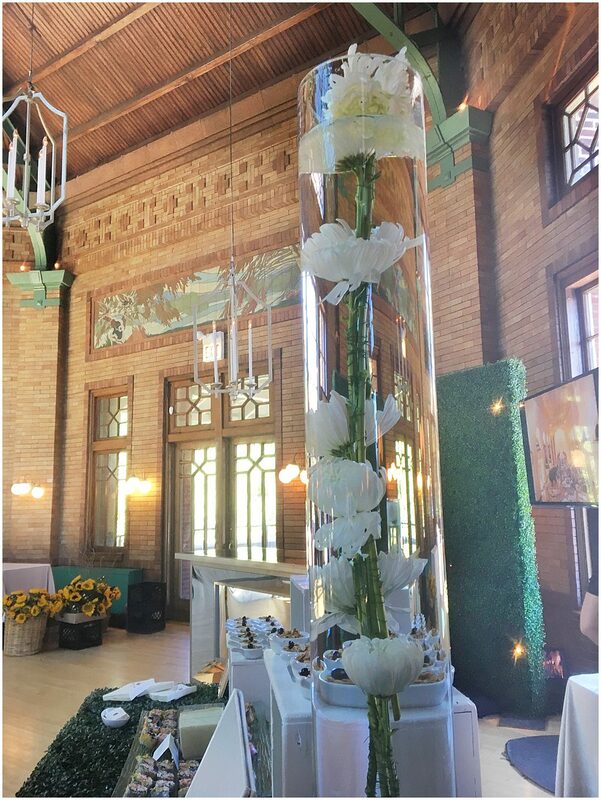 To create our submerged flower arrangements, we begin by filling our glass cylinders ⅔ of the way up with water. 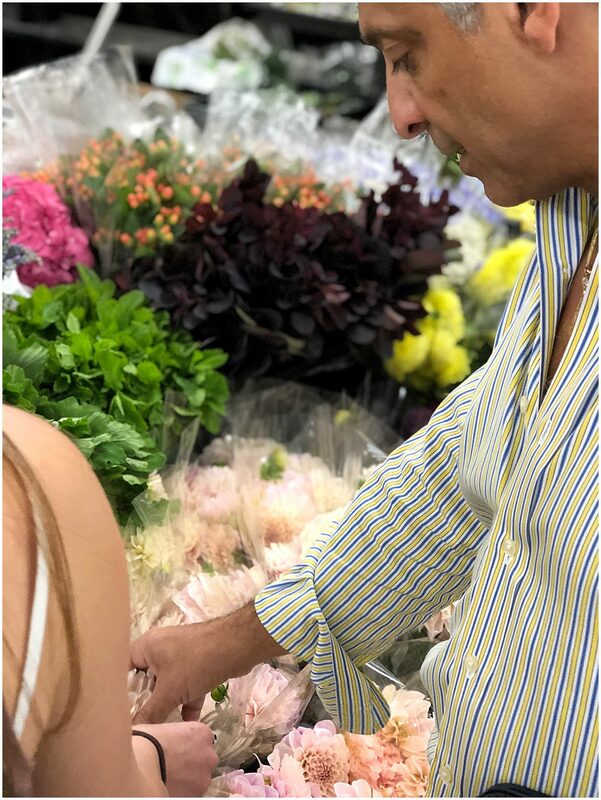 We then take our clipped mums and submerge them, placing a handful of clear marbles right in the center of the blooms, weighing the flowers down just enough. We then top each cylinder off with more water. Then it’s time to tackle our oversized vase. 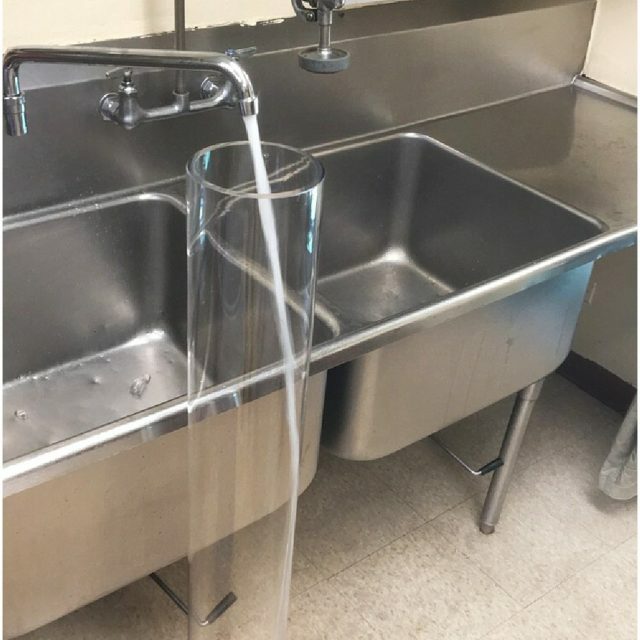 We found a large industrial sink in the Cafe Brauer kitchen and were able to swing the head to fill up the vase with water. We carefully carried it back to our table. To fill the vase with submerged mum blooms, we crafted a makeshift staff of flowers. 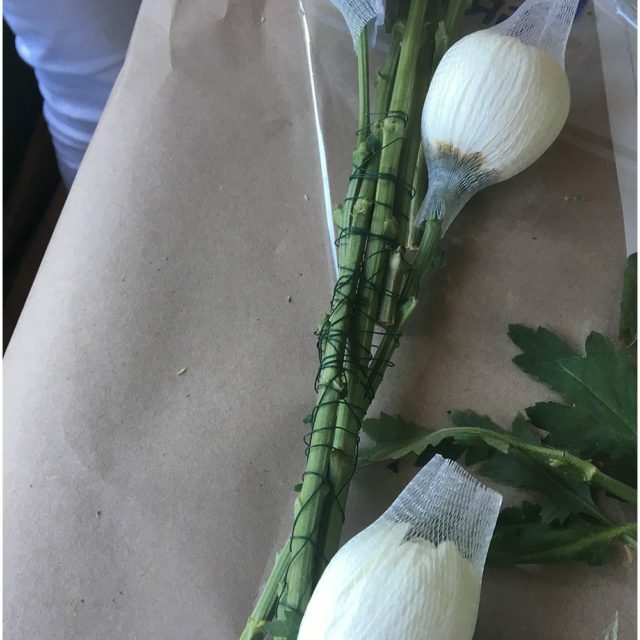 We ripped off any excess greenery that would muddy up the water, then began almost braiding the stems together with thin green wire. When the flower staff was just about as tall as our display cylinder, we dropped it in. Unfortunately, no amount of marbles on the top couple of blooms was enough to weigh the staff down and keep it submerged. 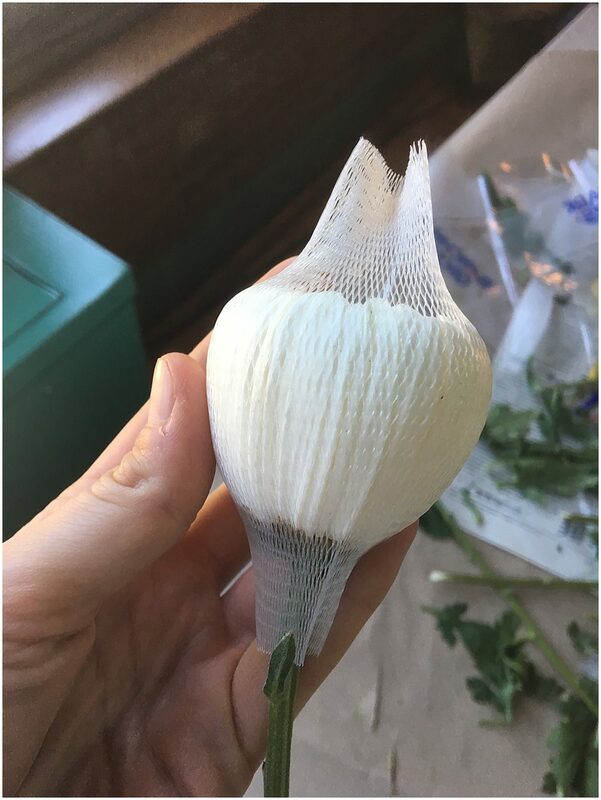 EC team member and resident problem-solver Lily crafted a little pouch out of the mesh petal covers that came over our mums. We filled two of these with our clear marbles and wired them to the base stem of our jumbo flower. 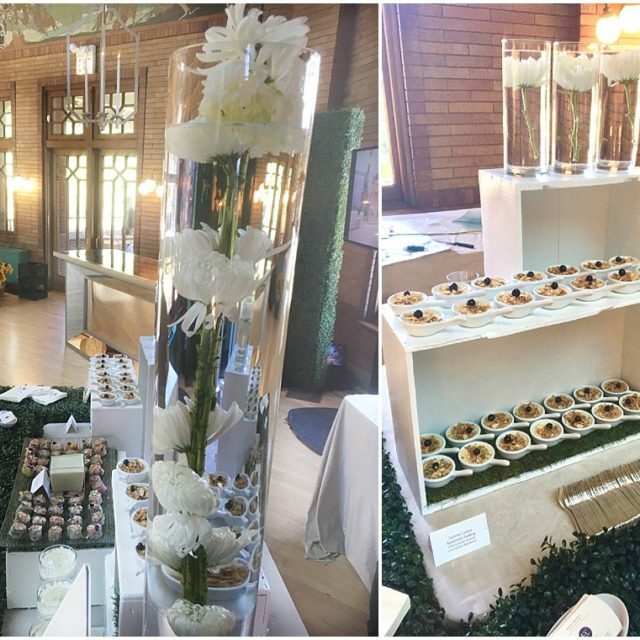 Our green and white, Litchfield-leaning buffet table is lush and elegant. 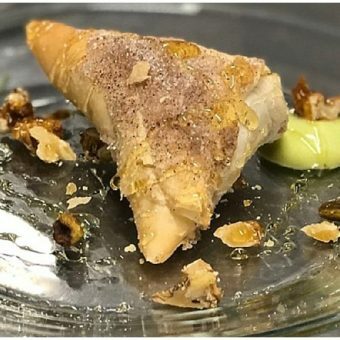 The lobster spring rolls, paired with a sweet pea aioli, are perched in perfect lines on subtle seafoam green glassware at the center of our display. 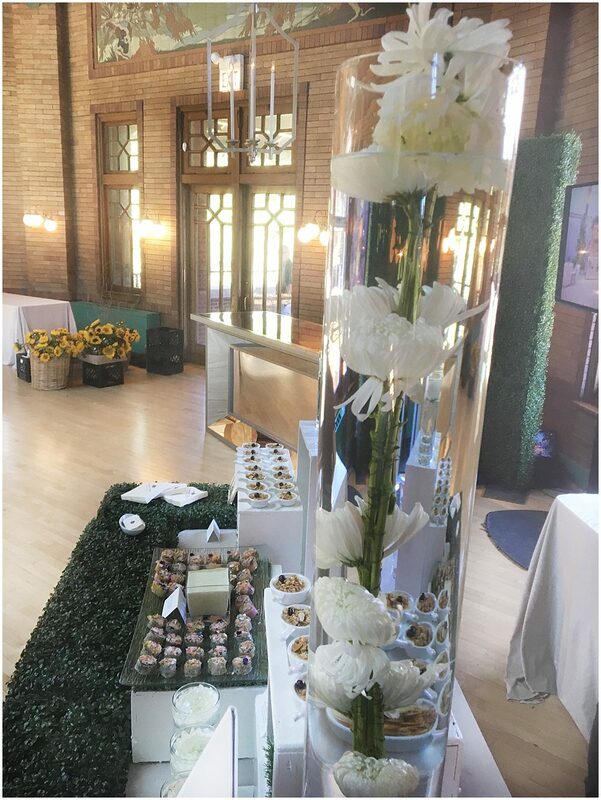 The faux hedge tabletop is flanked by our mini lemon buttermilk puddings, and our single submerged flowers are stationed throughout the boxes. For us, this is the dream Holiday in July design.